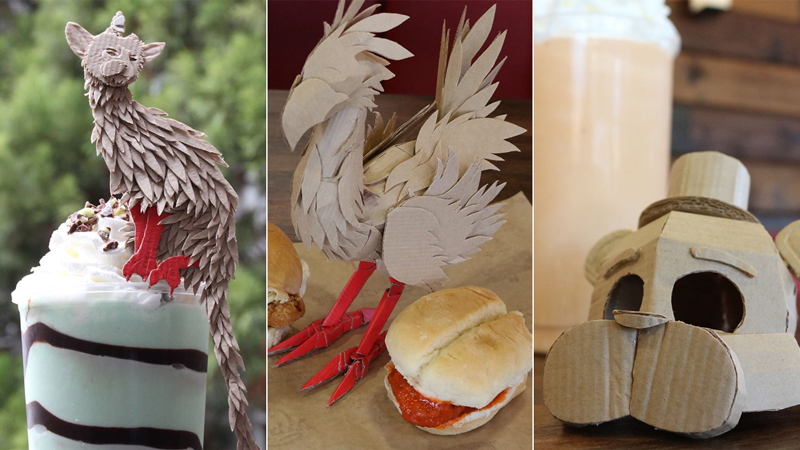 With many popular brands struggling to find a voice on social media, Arby’s spent 2016 charming an entirely new audience via gaming and pop culture papercraft creations. I spoke to Arby’s senior director of social and digital media about how they went from pictures of curly fries to cardboard chocobos. I follow a lot of restaurant chains on Twitter and Facebook in my capacity as steward of Snacktaku, and most of them are pretty painful. Taco Bell’s Twitter is filled with memes and bad jokes. McDonald’s goes back and forth between trying to be clever with hashtags and basic ads, a strategy that seems pretty popular across the industry. Arby’s Twitter and Facebook used to host more traditional ad-based content, but over the past year they’ve shifted focus, posting creative images and animated GIFs based on video games, anime, popular television shows and movies. Josh Martin, Arby’s senior director of social and digital media, told me how the change came about. Lost in a sea of similar ads, Arby’s wasn’t getting a lot of traction on social media, so the company opted to change its strategy. In the latter half of 2015, Arby’s started moving away from tweeting pictures of food tagged with really awful (I mean horrible) puns and basic ads. The company began focusing its creative efforts into crafting their food and packaging into references to popular television shows, movies and video games. A year later, these crafted pop culture references make up the majority of Arby’s social media presence. Classics or contemporary hits, no game is safe from the papercraft treatment. Arby’s is not the sort of fast food restaurant one generally associates with gaming. That’s traditionally been the realm of brands like Taco Bell or McDonald’s. Arby’s sees itself as a step above basic fast food, somewhere between basic and fast-casual. It’s not a restaurant someone stops by for a quick fix. Or at least it wasn’t. While gamers might not have been thinking about Arby’s, it’s obvious from the range of games subject to the company’s social creative efforts that the small team working on them has definitely been thinking about games. Martin explained to me that a small team consisting of people from his team and the creative folks from Roar meet regularly to plan out prospects based around new game releases and gaming events. Once they’ve got a plan, the team from Roar are given access to a local Atlanta restaurant (Arby’s is headquartered in Atlanta, Georgia) to put the pieces together. This image went out on November 11 to celebrate the release of Dishonored 2. Sometimes the group has to make educated guesses about gaming news that may or may not happen. A recent example would be the Crash Bandicoot piece that was posted to coincide with the PlayStation Experience event earlier this month. But even when the gaming news comes as a relative surprise, the Arby’s team is pretty quick on the uptake. Arby’s and its team at Roar will be putting that speed to the test later today, with a special event at 12 PM Eastern time on Facebook. They’ll be taking requests for gaming and pop culture themed holiday ornaments, crafting them in real-time, and mailing them out to fans. I need that TARDIS yesterday, which it can probably handle. Ultimately this is all marketing, and no matter how sincere the team’s love of gaming might be, the goal here is to engage customers. These are still ads, after all, though Josh Martin and his team are playing it cool. “We’re trying to come across as not forceful in terms of jumping into these conversations and creating these pieces of content. We’re not coming off desperate for attention. Owlboy. They even did Owlboy.